Gift Shop Assistance – Our Gift and Clothing shop sells an array of sundry items, small gifts, stationery, cards and clothing to our residents. Volunteers stock the shop and assist our residents with purchases. Beauty Shop – Our auxiliary has equipped a full service Beauty Shop for our facility. Our volunteers include licensed beauticians who provide haircuts, perms and wash & set services. Flower Arranging – River Bluff receives many floral donations from area churches and families. Our floral specialists rearrange the blossoms in vases for display throughout the home. Gardening – River Bluff is blessed with three beautiful landscaped courtyard areas. Garden volunteers maintain perennial beds and plant and tend an array of annuals in beds. Reading & Letter Writing – Volunteers assist visually impaired residents by reading books, periodicals and correspondence aloud. Letter writing helps residents keep in touch with family and friends. Visiting – Many residents simply enjoy visiting with our volunteers in their rooms, lounges or in our gardens. Residents enjoy sharing their life stories and hearing about what our visiting volunteers are doing in their lives. More Services – We have many volunteers with special talents that include leading exercise groups, playing musical instruments, pet visits and helping with Birthday and Christmas celebrations, just to name a few. Memorial Fund – Our Memorial program administers gifts to the facility in memory of residents and community members. Memorial donations are used to purchase equipment, activity supplies or other items that complement our vision of providing the comforts of home for our residents. 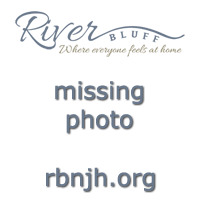 Our memorial fund is a giving option within the River Bluff Nursing Home Foundation.